Screwdrivers: The difference between a standard screwdriver and a Phillips screwdriver is the shape of the head, as shown here. 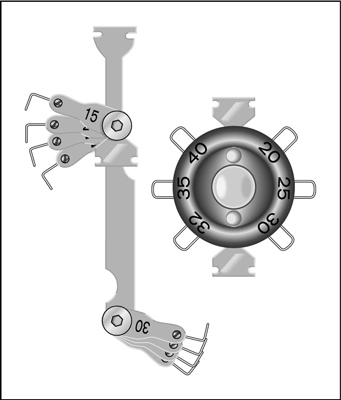 Standard (a) and Phillips (b) drivers and their screws. Offset screwdrivers are handy because they make it easy to get to screws that have little clearance over the head. Offset screwdrivers come in both standard and Phillips styles and some have one of each type of head at either end. 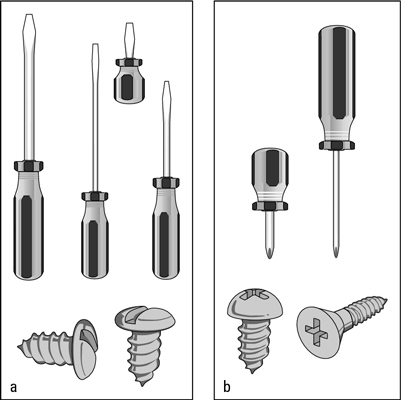 Screwholders: Instead of holding a screw in place with the fingers of one hand while wielding the screwdriver with your other hand, you fit the screw into the screwholder and use it to insert and tighten the screw. A screwholder helps you get into hard-to-reach places. Wrenches: Wrenches are probably the most basic tools for auto repair. Most wrenches are available in both standard — also known as SAE (Society of Automotive Engineers) — and metric measurements. Today, most American vehicles have a mix of SAE and metric nuts and bolts. Foreign vehicles or foreign components used on American vehicles (a practice that’s becoming quite common) use metric nuts and bolts — even the inch-based British. 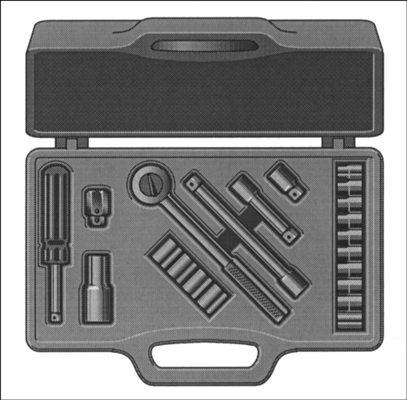 Socket wrenches: Socket wrenches come in sets for a wide variety of prices, depending on quality and how many wrenches are in the set. You need at least one ratchet handle; most sets have two or three handles with at least one adapter. Socket extenders are indispensable items to help you reach those almost-unreachable nuts and bolts. 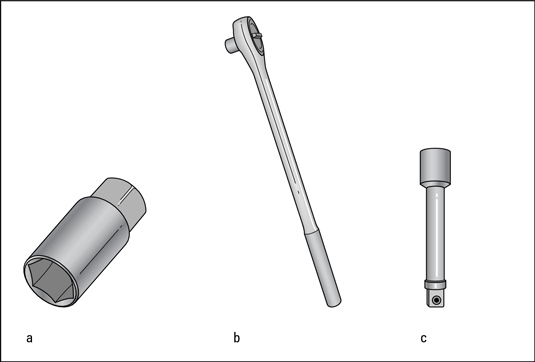 A spark-plug socket (a), a ratchet handle (b), and an extension bar (c). Combination wrenches: Combination wrenches have one open end and one boxed end. These wrenches come in sets of several sizes, and each wrench is made to fit a nut of a specific size, whichever end you use. Torque wrenches: These wrenches are designed to tighten a nut, bolt, or screw to an exact degree to avoid under-tightening or over-tightening. 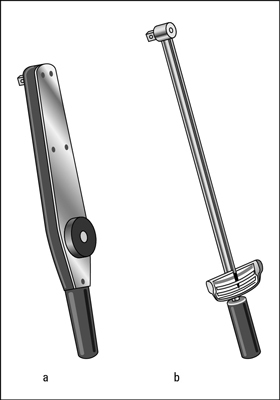 A dial torque wrench (a) and a deflecting beam torque wrench (b). Adjustable wrenches: You probably already have a crescent wrench in the house, and you can adjust the jaws to fit a variety of nuts and bolts simply by turning the wheel. Pliers: If you have to buy pliers, the very best kind to get are combination slip-joint pliers. You can adjust this general-purpose tool to several widths with a sliding pin. 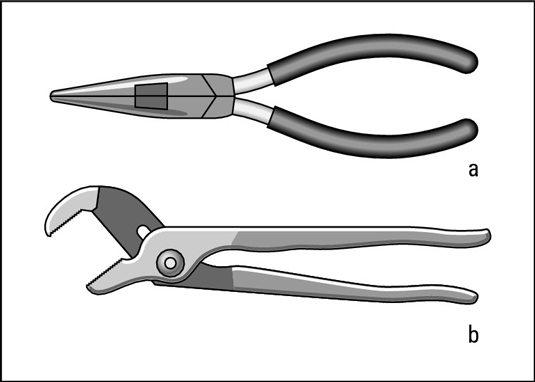 Needle-nosed pliers (a) and combination slip-joint pliers (b). Tire pressure gauges: If you never check anything else on your vehicle, make a habit of regularly checking the tire pressure; it’s critical both for safety and good fuel economy. Wire and taper feeler gauges: You use wire and taper feeler gauges for “gapping” spark plugs. Compression gauges: You use compression gauges to check the pressure that builds up in each cylinder as your engine runs. In addition to these basics, you might want a work light. Fluorescent work lights can draw power from the car’s battery or cigarette lighter or plug into a wall socket. They also come with changeable batteries, like flashlights. And if your car didn’t come with a jack, you’ll want to be sure you get one of those, and jack stands too!